This CD has 42 songs from 41 different countries sung in the native languages and in English. You’ll learn international facts about people, places and different cultures. Nothing gives a better feel for a culture than its music. 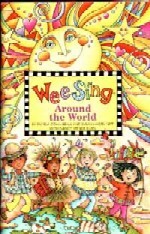 This is the perfect companion to our Geography Songs or to any other geography program you might be using. A celebration of the Bible in music and song! 63 classic Bible songs you and your children will love. This set has a song for the Books of the Old Testament and a song for Books of the New Testament. The great, timeless Bible songs your kids need to know! 47 more songs - favorite spirituals, prayers, action songs and Bible verses. Learn the 12 Apostles in a song from this CD.